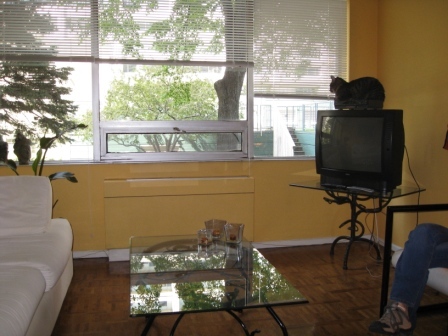 E. and I were able to stay in Toronto for about six weeks in May and June. I was busy with work at the time and wasn’t able to pull together any pictures. Our apartment was in the middle of a downtown shopping district called Yorkville and down the street from a city library. 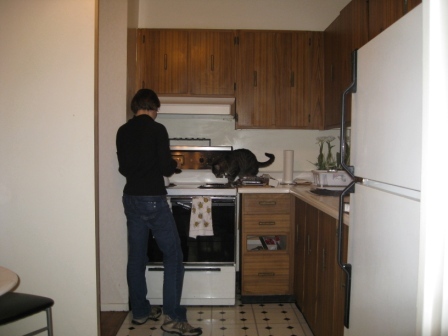 Luckily (or unluckily) for us, we were able to take care of our landlady’s cat for about a week. As I’ve detailed in past dog and cat posts, I love animals, but I have a moderate cat allergy. After a couple of days, I was sneezing so much that I had to carry around a box of tissues. Our landlady must have had a guilty conscience because she dashed over one night and took our fake pet away. It was probably for the best because it sat on the counter while I cooked. This bothered me. 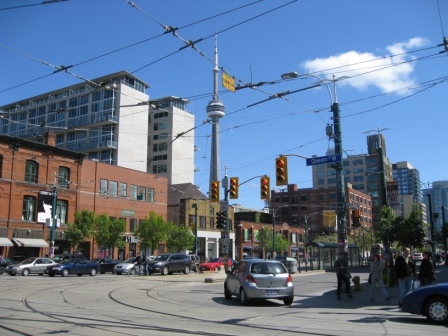 The skyview is interesting in Toronto because of the cable cars. This picture reminds me of Abbey Road. We tried to include the CN Tower in most of our shots. This is kind of a gloomy picture of Chinatown. I had the best fried Chinese dumplings I’ve ever tasted here. I also tried cane sugar juice for the first time. 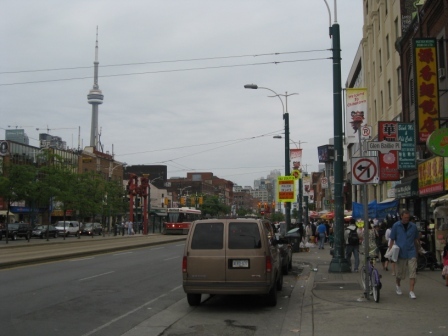 Kensington Market is next to Chinatown. It’s an eclectic neighborhood where gourmet items, vegetables, fruits, and ethnic foods are sold. 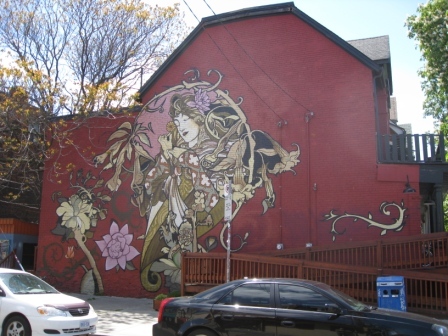 I liked this Mucha-inspired art deco painting on the side of a building there. Near the end of our stay, both my and E.’s parents came to visit. 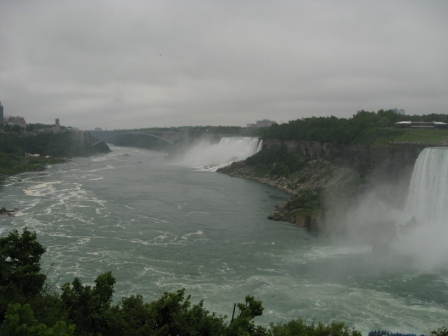 We took them around the city and drove to Niagara Falls for the day. One of the highlights of our time in Toronto was getting to meet one of my favorite bloggers and friends, Ricki of Diet, Dessert, ‘n Dogs. We met for lunch and dinner and talked about our favorite things including food and teaching. She kindly brought me some homemade cacao-walnut butter spread and her cookbook Sweet Freedom and proved that she is just as nice as she seems from her lovely blog! Please help Ricki get on the Ellen Show, as Ellen has already featured her book on her show’s Web site. I think Ricki’s a perfect fit for the show. And what do you mean, Canadians are mean?!?!!!! Have you been watching too much South Park–?!!!!!!! We are so NOT mean!!! We are friendly!!!!!! AND POLITE!!!! AND USE LOTS OF ALL-CAPS AND EXCLAMATION POINTS!!!!!!!!! Whew. Guess I’m more patriotic than I realized. 😉 In any case, thanks, too, for the Ellen plug–almost time to start that campaign anew! I love reading your descriptions accompanied by photos of places I’ve never been. 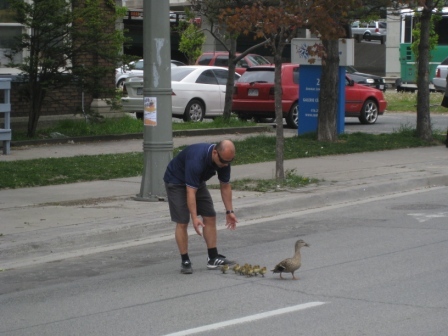 The driver helping the duck and her ducklings cross is sooooo cute. The cat on the counter is NOT cute. Sounds like Roma 🙂 She’s visiting at the moment, but she’s pretty well-behaved this time. Miss you guys. Glad you’re back on the blog so I can follow you’re whereabouts and doings. A squirt bottle with plain water does wonders for cat training. I’m having some issues with my felines tromping on the counters in our new home. A cardboard flap with sticky tape should put the little furries back in line. 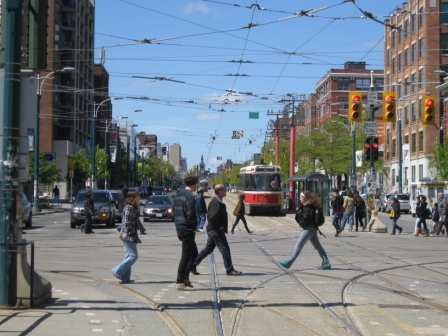 Sure had a great time in Toronto, and being led on excursions around the city. The Botanical garden was lovely, and really enjoyed Chinatown!! Niagara Falls was also a real treat!! I like the pics. 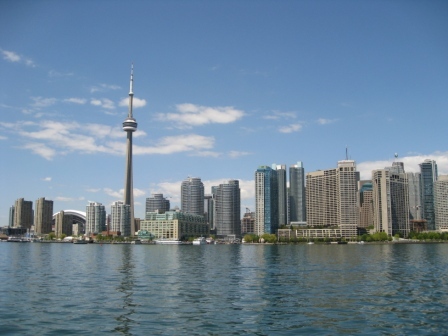 I’m sorry to say that I’ve only ever been to the airport in Toronto but I would like to visit someday. It’s on my list! I am missing Chinese and other ethnic foods so much! Please have some dumplings for me, wherever you are. Awww- I love Canada. I miss it (even though I was on the other side). But I’ve heard that June/July in TO is really hot & humid. I miss you guys & have been meaning to skype/email.. but alas. Hope you’re well – love to you & E.
Hi! I was just thinking about you! How’s Miami? Where are you??? I’ve missed your posts and adventures. Thanks for your message, Catherine. The blog was interesting and insightful. I have traveled and lived as an expat for over 15 yrs. and loved your pics and comments. It gave me look into your everyday life and made me homesick for the expat lifestyle again. Thank you! Hope to visit here one day. A. are you still on here?!?! How are you??? Please email me, tell me what’s new. I have so much to tell you!